These unique and powerful classes offer the same curriculum as our Mixed Age classes in a special setting - a senior retirement center. You and your child will connect with a community of elders who are excited to sing, dance, shake shakers and swing scarves together, learning from and interacting with each other. 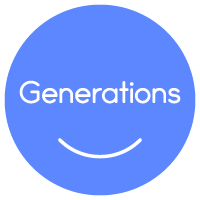 Experience the joy of our generations classes! Siblings of registered students who are 10 months and younger by the class start date attend for free, however we ask that you register them also. Try a class before you enroll! Sign up using our Demo Scheduler.